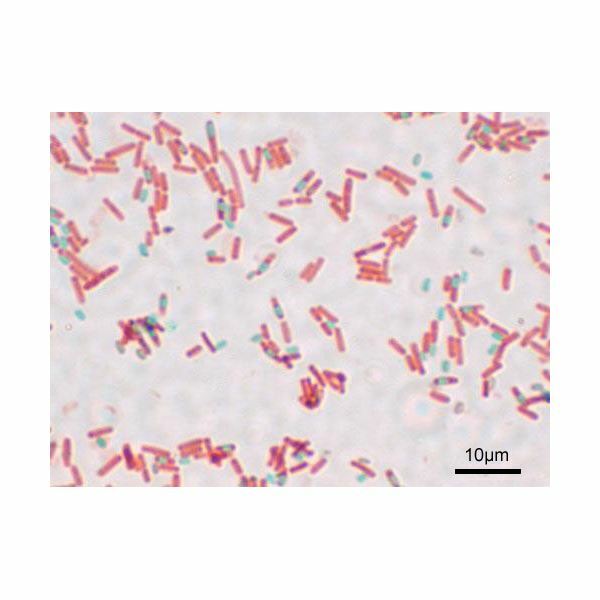 Some gram-positive bacterial species such as Clostridium sp, the causative agent for diseases like botulism, gangrene and food poisoning, create a structure called endospore. They do this immediately after sensing an unpredictable future signaled by the depletion of various nutrients in the environment and the threats of physical and chemical factors. The living and active bacterium is called the vegetative cell, while the endospore that it form (prior to its death) is the “resting" cell. A copy of the bacterial DNA, few organelles, and some nutrients are enclosed in the endospore. These enclosed materials are protected by thick and durable walls that could withstand extreme pressure, temperature and reactive chemicals. Bacterial endospores are medically important because they are the agents on how anthrax is transmitted (e.g. powdery material in letters) and how bacteria survive the normal cooking process and cause food poisoning (botulism) to diners (Tortora 2005). Bacterial endospores can remain dormant for thousands of years (Tortora 2005). Some researchers were successful in germinating bacterial endospores found in the stomach of a stingless bee that is 25- to 40-million-year-old (Tortora 2005). Endospores of Thermoactinomycces vulgaris taken in Elk Lake, Minnesota were successfully revived after putting them in a nutrient medium (Tortora 2005). When the bacterium senses that essential nutrients like carbon and nitrogen are depleting, it begins to replicate its DNA and places it in a corner of its cytoplasm. An ingrowth from the plasma membrane called septum would begin to envelop the DNA-cytoplasm region and isolate it from the parent DNA and the rest of the bacterial (vegetative) cell. The septum is double-layered and each layer is deposited with peptidoglycan just as the deposition of peptidoglycan in bacterial cell wall. After the formation of the peptidoglycan layer, an additional protein protective coating (called spore coat) is given that provides the bacteria even greater strength and durability (Ingraham 2000). The diameter of bacterial endospore could be either smaller, the same, or larger than the original (vegetative) cell; it depends on the bacterial species. Location of the endospore inside the vegetative cell could be “terminally (at one end), subterminally (near one end), or centrally inside the vegetative cell (Tortora 2005)." The bacterial endospore almost completely lacks water in order to inhibit metabolism. Later on, the presence of water or moisture initiates the germination process, and new vegetative cells would be created. The endospore packed only DNA, little RNA, ribosomes, enzymes, and some essential small molecules. The endospore also houses dipicolinic acid in the cytoplasm together with large amount of calcium ions. All these materials would be used by the bacterium when it germinates at favorable conditions (Tortora 2005). If normal vegetative cells are killed by processes such as “heating, freezing, desiccation, use of chemicals, and radiation" (Tortora 2005), endospores exhibit resistance to all of these processes. Endospores, therefore, are headaches of food manufacturers that are trying to do anything just to control them. These manufacturers are spending a lot of money to maintain the quality of their products and finding ways on how to stop spoilage that may affect their sells (Ingraham 2005). Bacterial endospores are responsible for the occurrence of some food poisoning cases. Germinated endospores produce toxins that could be lethal to those who eat infected food. Print Sources: Tortora, Gerard. 2005. Microbiology: An Introduction. Singapore: Pearson Inc.
Ingraham, John. 2000. Introduction to Microbiology. Pacific Grove, Calif.: Brooks/Cole Pub.